Thank you to our Collaborating Organizations! The EBC Ascending Professionals Committee would like to invite you to attend our Second Annual Charity Networking event, hosted at Night Shift Brewery and Tap Room in Everett, MA. Join us for an evening of networking, while supporting a great cause. This year, proceeds will be donated to the Mystic River Watershed Association (MyRWA). Founded in 1972, the MyRWA implements its mission to protect and restore the Mystic River, its tributaries and watershed lands for the benefit of present and future generations to celebrate the value, importance and great beauty of these natural resources. The MyRWA works towards its strategic plans and goals to live its mission. Tickets will include a drink ticket to select from the many Nightshift craft beer options, and appetizers throughout the night. Thanks to our generous hosts at Nightshift Brewery and Taproom for accommodating this charitable event. 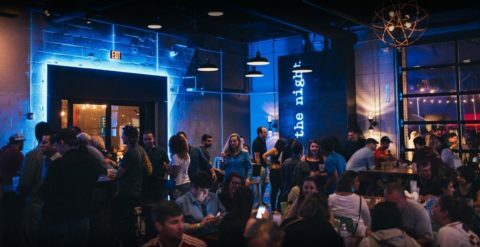 This local hotspot is the perfect spot to enjoy the night making connections and make a difference! B e sure to sign up and join us for the opportunity to win a door prize generously donated from our hosts at Nightshift! The brewery is located at 87 Santilli Hwy, Everett, MA 02149, directly across the street from Teddie Peanut Butter. The Orange Line’s Wellington Station is the closest T stop (about 15 walking minutes from brewery). Convenient parking is available either in the Nightshift private lot to the left of the building, or along the street (except on street-cleaning days – heed the signs!). Please DO NOT park in the large, dirt lot to the right of the building – this is a privately owned lot (not owned by Night Shift) and you WILL get towed if you’re there long enough. Thanks! Michael Shea, Account Manager, Resource Options, Inc.